Test after test, I should say this is the most beautiful blessing to my life. This phase of life not just increases my age but my maturity gradually, to be more tougher and stronger than what I actually think I could be. To have those faces who believe in myself even more than my own self, it's a blessing as well. Honestly, I almost died in the halfway of getting success, I almost lost my hope and belief in me, just then He came asking me to never stop but keep moving still. Let it be a slow step after step to the upfront, but shall I never stop moving. Because after all, chances are meant to be treasured; not wasted. In that, I believe. Thus, I want to reach this means. The way of me getting nearer to the creator of success; is to succeed this means indeed. I want to work even harder this time and give the very best I could to have this means, succeeded. I want to treasure every hardships and tears; making me a better human, a better muslim. Verily, for every hardship comes ease. While you are so in love with human, I want to be in love with the creator of love. To love is to give, and I shall give more-- more than I could. I want to contribute myself in serving for my deen thus if Allah wills; syaheed shall be my aim. InsyaAllah. I know this a long way to go, still. But let me try, until I get myself knackered. Until I exceed my own limit, I want to keep moving. Even faster than before. Even farther than before. For those who still in my back supporting, may Allah grant you happiness in both Dunya Akhirah. And those who left after promising not to; may Allah bless you too. Tomorrow, what will you bring? To mend my broken heart. Will you leave me without tears? Will there a good news to be heard? Will there be something for me to be proud of? In Allah, I put my trust. For what's the best and something I need, my faith is in You. Test is a blessing, so does blessing is a test. If there was something I would want to have now, it is to have my heart reclaimed from the attachment of Dunya. To have myself known that this way is a means and only it; it never a true destination indeed. In the world where there are invisible ladders, step by step up leading to the summit of Heaven. And for every class, there is a different ladder, and for every traveler's way there is a different heaven. Different way to call 'happiness', and mine is the realization that Allah's choice is the better. Bring me to the Hikmah, and I should not be worrying anything but to give my whole heart to You. May Allah ease, for what's the best I could have. Can painkillers mend a broken heart? When the white turns black it means pure turns dark. So does the heart of a man where good becomes vicious. And suddenly, all the past words are nothing but a mere passage that is meant to be history and something to be dwelled on. All the lovey dovey words are asked to be forgotten like nothing had actually happened. Like they said, this is the real deal to actually end every pieces left. You remained silent for never intended to putting up any more costs, but it seems to be a hell wrong way you've chosen and there's nothing you can do about it, anymore. Guess there's the truth in saying men are like that, they want and you can't hold it anymore or else they'll leave. Their determination of having something they've always wanted was never a joke, you got to give what you got to give. And a poor soul like you is like that, trapped in the absolute poverty while in no idea what the hell actually is happening. You are just, an absolute loser on your own battle. You watch and you learn the lesson, in despair and total shock of truly colors appeared. You want to do something, but pride won't allow. Chasing someone after he had choose someone else is a total mess. It's like I'm buying another hell out of bad fate to the life that has already broken. Love; the scariest thing ever in this moment is actually a poisonous potion for broken soul, like mine. Question remains, can painkillers mend a broken heart? If Shakespeare was to be my favorite poet, Rumi should be even higher than that. So then I called him; my soul. Indeed, he is. He speaks my thoughts, my feelings. He knows how to 'dakwah' or actually tame my heart using his magical words; yes poetry is no gimmick in calming my soul and wild heart. It tells you something you never imagined knowing, it describes something you never imagined existing. 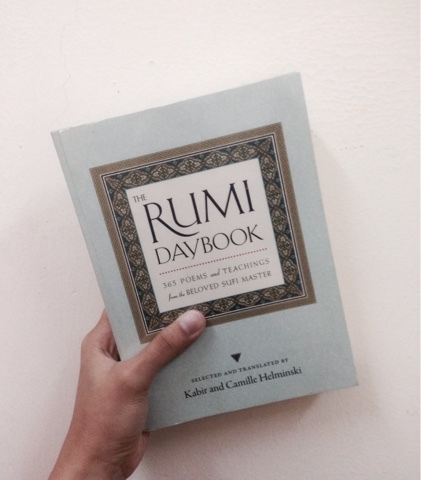 I've read few books of different poets; but Rumi is the most powerful writer. His writings are pure, sophisticated and raw. Simply a spectacular masterpiece you would ever read. However, this was given by most unique 'D' thus making this book even more special than it actually is. A complete 365 poems for an entire year should be something I always carry on whenever I go. This is not a promotional entry; it's the passion I'm writing about though. It's not possible to carry my heart anymore. Being a girl is tough. Being a girl without knowledge is tougher. However, we can learn. Told ya before, there are few lessons that couldn't be learned in school. Like how to manage life, choosing a good friend and even knowing as if that guy is a good guy for us. This might be a reliable source for you as a guide, but still it just a book. It limits to some extents but I'm very sure it's beneficial if you can learn one or two thus making you a smart girl in choosing a right guy. Not hardly recommending, simply want everyone to at least read and learn. 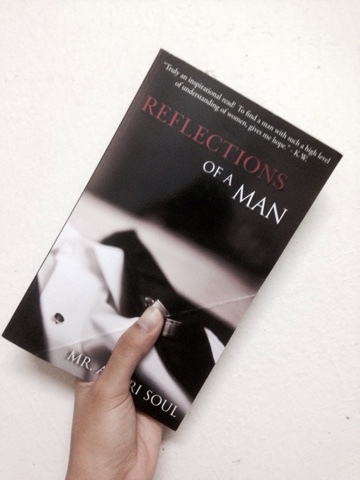 Reflections of a man; a lesson even your mother might not know.